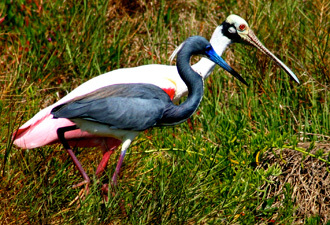 Two fishin' buddies, the tri-colored heron and roseate spoonbill walk along the barrier island. 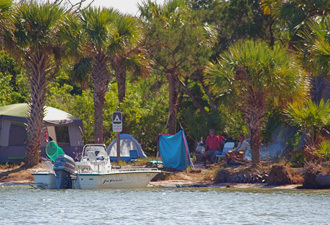 Visitors enjoying backcountry island camping. Sitting on the beach with toes buried deep in wet sand, you can hear the ocean waves slapping the shore, drowning out the cares of everyday life. We are so small in comparison to nature. Thinking about your connection to the sea you might question why we value it so highly. This seashore draws you in, enticing you to wander miles of coastline and to thrill at the treasure of an empty seashell or a worn piece of blue sea glass. You feel the ocean before you see it — it hits you the moment you enter Canaveral National Seashore. As you roll down your car windows, the salt air tickles your senses and the rush of the sea breeze wafts across the dune in waves, pulsing like the surf itself. Canaveral National Seashore is located on the East Coast of Central Florida, often touted as the “tourism capital of the world” mostly because of the many theme parks situated in adjacent Orlando. But once you enter the seashore, you could not feel farther from that Florida. Canaveral consists of 57,000 acres of undeveloped Florida coastline and salt marsh lagoon unmatched anywhere else in the state. This is no peaceful gulf side water — the Atlantic Ocean is dynamic, constantly in motion, and powerful to behold. You'll see its effect in the gnarled branches of the hammock live oaks as they hold on for dear life in the barrier island's sparse sandy soil and in the rough and unforgiving saw palmettos that line the backbone of the dune. Early Florida Indians were drawn to the shores of this place for nourishment of body and spirit, just as we are today. As you walk the trail up Turtle Mound, you'll take in a view that has been seen for centuries. A guided walk through Eldora or Seminole Rest again brings realization that generations of people have been drawn to this saltwater sanctuary, perhaps to escape the frigid northern winters or to start a new chapter in American history. Always it is the sea that beckons. Walking along the 24 miles of undeveloped coastline, you'll see little more than shoreline and ocean. Canaveral National Seashore is a place for wandering. Discover hidden treasures along the water's edge; learn about the 5000 sea turtle nests that grace these shores in the summer and the countless birds that range the seashore through all seasons. Kids can have fun learning new things with the Junior Ranger program or just building a sand castle. 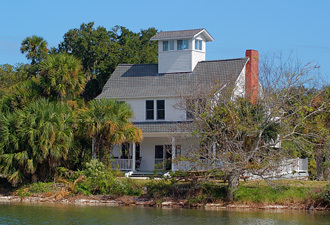 Come to Canaveral to watch wildlife, discover history, or just to let your mind wander and your toes wiggle.